Fairly cheap, eco-friendly dryer ball and sheet replacements | Save. Spend. Splurge. I don’t use dryer sheets or balls (they’re plastic), because I was once told that the nice smooth silky feeling your clothes get, is actually animal fat coating the fibers. True or not, I stopped using them about 5 years ago and I haven’t noticed any static but this is probably because I wash my clothes in communal laundry areas, and the residue of other dryer sheets gets onto my clothes. That’s why I absolutely love this dryer ball wool felt alternative by One Good Thing by Jillee. For $5, and with some essential oil, you can avoid buying dryer products (and we love saving money!! ), and be eco-friendly to boot, as you won’t be tossing them into the garbage or buying silicone/plastic dryer balls. Looks pretty easy to make. The idea is just to grab a wool skein, making 4 dryer balls out of it, turn the first layer into felt by covering it pantyhose and drying it, and then it’s good to go. They’ll get smaller and smaller as they continue to felt, but you can wrap a new skein around it once it becomes too small. I’m thinking of doing it…. At the very least, to make my parents stop using dryer sheets/balls. Cool idea! I’ve actually never heard of these before so I might have to try them out! I use way too many dryer sheets. Well you can also use tinfoil apparently! That’s a great idea! I’ve never heard of a dryer ball like that before–very cool. I’m now intrigued… my wash may never be the same :)! You can also use balled up aluminum foil…you can keep reusing it in the dryer. Works great! I’ll have to check this out. We haven’t used sheets in years and also have noticed zero difference, but we’re in the communal laundry boat, too. I haven’t used dryer sheets in years and years. I use them very occasionally, usually if old towels are starting to get a bit gross or something. 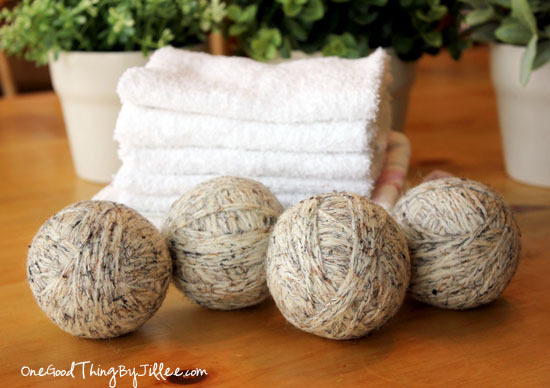 The wool balls sound interesting and a LOT better for the environment than throwing out dryer sheets all the time. I don’t use them at all but I notice things are getting staticky. I might do a wool ball soon. I’m so confused… I would think MORE wool/fabric would just create MORE static. I have to try this one day. I was amazed when someone told me all dryer sheets do it prevent static. I stopped using them and didn’t replace them with anything and haven’t really noticed a difference. I think these wool balls would make a great Christmas gift though, thanks for the suggestion! I’m trying this. I’m starting to get static and I just want to kill it.